You have been cooking frozen peas wrong your entire life. Peas should not be boiled! You can have flavorful, creamy peas in less than 10 minutes. Try them tonight! You have been cooking peas wrong your entire life. Peas should not be boiled! You can have flavorful, creamy peas in less than 10 minutes. Try them tonight! Ok, I admit, I am totally guilty of ripping open a bag of frozen peas and throwing them into a pot of boiling water 5 minutes before dinner and serving them as a side dish. I have never hated peas, but I have never loved them. 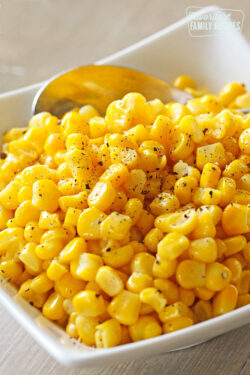 They have always just been an easy side dish but they have never been anything special. Until I went to Epi’s (My FAVORITE restaurant in Meridian, Idaho). On Thursdays, Epi’s offers free peas as an additional side dish to any meal and people specifically go there on Thursdays JUST for the peas. WHY? Because her peas (like everything else on the menu) are AMAZING. Like, they are craveable. PEAS. That boring side dish that no one cares about can actually be seasoned to the point of actually being delicious. 1. Don’t BOIL! Just don’t do it. I know the package tells you to. But don’t. Trust me. 2. Add a little sugar to the peas. It’s ok, it won’t taste weird and it will bring out the natural sweet flavor. 3. Don’t salt until ready to serve. Salting them too early can dehydrate them and they (obviously) won’t be as sweet. Salt them after they have cooked and you can salt to taste. If you want to try something different, and dare I say “fancy,” try coarsely tearing up a few mint leaves and throwing them in with the peas while cooking. Leave the garlic and sugar out and just cook them with mint and butter. 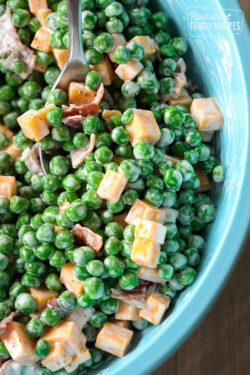 The mint infuses the peas with a fresh and delicious flavor that you are sure to love! It kicks dinner up a notch with very little effort. Try it with Easter dinner! What is the difference between petite peas and regular peas? Petite peas are usually sweeter and more delicate than regular peas. 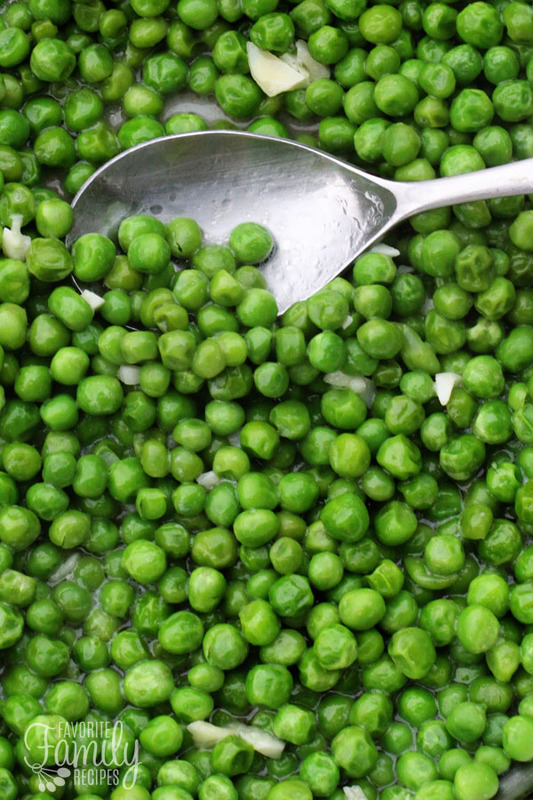 Regular peas are more meaty but the skin on them is a little tougher. What is the best way to season frozen peas? If you are using this method of cooking frozen peas, just a little salt and pepper is all you need. If you are wanting to make the peas a little fancier try adding some mint (see notes above). Fresh peas or frozen peas? Believe it or not, frozen peas taste better when cooking. Why? Cook’s Illustrated has a great explanation HERE. It’s definitely worth a quick read. 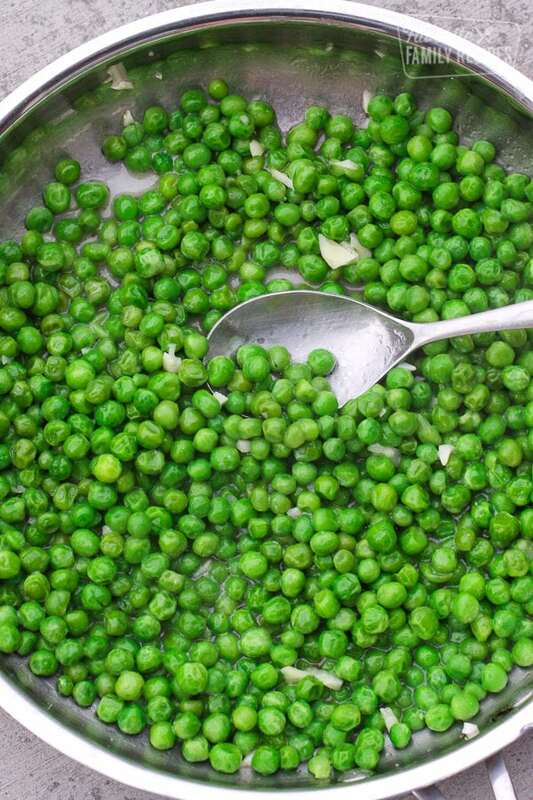 Now that you know all about peas… it’s time to make them! You have been cooking peas wrong your whole life. Peas are supposed to taste GOOD-- here's how to do it. In a medium-sized skillet over medium heat, combine peas, butter, sugar, and garlic. 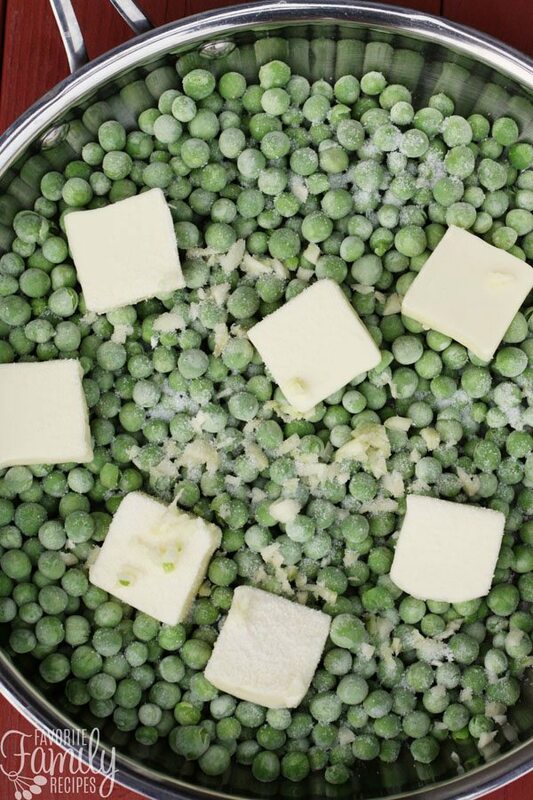 Cook until butter is melted and peas are heated through, (5-7 minutes) stirring occasionally. Remove from heat, add salt and pepper. Serve. I’ve done the same thing with frozen “peaches and cream” corn. Tastes amazing and I feel like by not boiling it you’re not losing some of the nutrients in the water. What about canned peas? Just kidding! Canned peas are super nasty ???? This really is the best way to make peas! Thanks for sharing! I am from the Boise area but have never heard of Epi’s. I’ll have to look it up now! Can’t wait to try these tips. Oh my goodness! You will love Epi’s. I have never had anything there that I haven’t liked. Book in advance because they fill up fast! Really tasty. I never boiled peas before, but the seasonings were a fresh idea! I tried this and they are amazing, thank you. Thank you! These were amazing! The package tells you to boil them for 5-7 minutes to kill bacteria like Listeria, which has become a problem with frozen foods. They need to be fully heated to 165 degrees. Other than that, I’m going to try the mint & butter recipe. It sounds yummy. Thanks! My PEA LIFE will never be the same…I was not a big fan of peas until I tried cooking them this way. DELICIOUS!! Ummm. I’m not certain I did this right. I followed your instructions, and even cooked them for a bit longer, but my peas are still pretty hard and fibrous, not soft and supple like my kids and I are used to from boiling them. Is this normal? Was I supposed to defrost the peas first? Hmm that is really weird! They should soften up just as much as boiling them. No defrosting needed. Did you just use typical frozen peas? Hi there! Time to comment because I have used your recipe for a year now. My family never ate peas before, but now the veggie is requested weekly! ( “you’re making the good ones, right?”) thank you! This comment just put a big smile on my face! Thank you so much for coming back to let us know how much your family has enjoyed this recipe! I bring water to a boil, add peas when water is boiling…the water will cool somewhat because of the cold pears. wait till the water boils again then shut off stove. Peas float to the top when hot…drain and stir in butter. They taste like they were just picked. I add vegetable or chicken bouillon to my peas and that’s all you need. I followed your recipe to a T. Best peas I ever ate in my life. And I’m in my forties and I love peas! I am so glad you liked them!! Thanks for the 5-star rating! 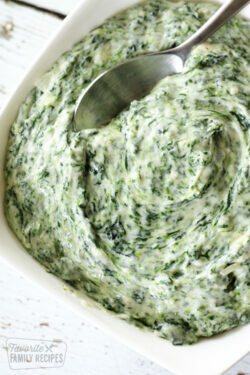 This recipe ROCKS, and all other recipe’s are just average! Simply the best peas EVER!! Thank you so much for the 5-star rating!! We are so glad you love this recipe! I’m going to try this recipe, but I have to say, add that much butter to anything and it’ll be tasty. No big secret there. Lol yep.. it’s true! That’s a big part of why these are so tasty! We prefer to bake our potatoes, skin on. Cool and shred! 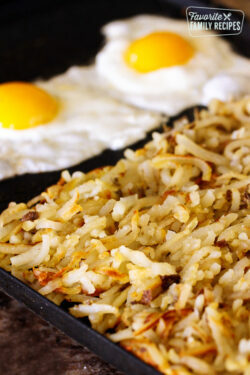 Much more flavorful than boiled potatoes and they make the best hash browns or American fries. I’d go one better and say never boil ANY vegetable. Boiling veggies just means you’re pouring half the nutrients and half the taste down the drain. Steam, roast, saute, microwave (if you just have to) but please don’t abuse our vegetable friends by boiling. The only time they should come in contact with a hot liquid is in a soup recipe, where nutrition and taste don’t go to waste. Yes! I agree completely! Boiling vegetables also makes them taste so bland. Thank you for sharing! Exactly what I was thinking when I saw that much butter for 1 lb peas. It would be helpful to know how much fresh mint to put in and if the pan should be uncovered or covered after putting in the butter. I just use 1-2 leaves of mint or it will be too overpowering. No need to cover the pan. Hope this helps! I have never commented on a recipe I’ve tried before but I just had to with this one. BEST PEAS EVER!!! I can’t stop raving about them to my friends and family. Thank you for sharing!! You are very very welcome! Thanks so much for the nice comment– and the 5-stars!